" Probably the best and best-known private cooking school in the country." 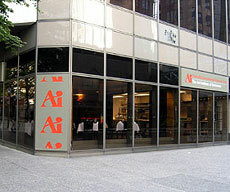 There are lots of ways to measure the success of The Art Institute of Vancouver - Dubrulle International Culinary Arts. The over 2,500 graduates who have walked through the doors and into hotels and restaurants around the world since the school began in 1982. The list of prestigious chef instructors who have chosen our school above all other schools as a suitable forum for sharing their knowledge. 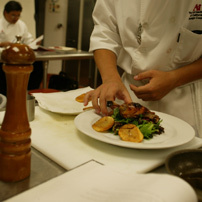 The Internationalal reputation that has been earned from being the first private school of its kind in Canada, offering the necessary grounding in classical European cuisine, never compromising on quality, and never cutting corners when it comes to the student's educational experience. Since 1982, thousands of successful graduates have passed through the doors of the School and out into an ever-changing and evolving restaurant, foodservice, and hotel industry. They have found that the school has prepared them to contribute their new-found knowledge, enthusiasm, and creative skills to the dynamic and exciting world of the International professional food and hospitality industry. The Art Institute of Vancouver - Dubrulle International Culinary Arts has become a leader in the culinary field, establishing standards of excellence that draw professional cooks and serious amateurs alike to attractive and modern facilities in the heart of Vancouver, Canada. So .... why do they come in such numbers? Perhaps it's the location in one of the world's most beautiful and culinarily adventurous cities. A city with more Five Diamond hotels per capita than any other city in North America. Perhaps it's the fact that students will be challenged by Internationally trained instructors who share distinguished professional experience, as well as a gift for teaching the fundamental techniques of the culinary arts and the sophisticated business skills needed to survive in today's restaurant and hotel markets. Then again, perhaps it's the opportunity for interesting and diverse on-the-job local and International practicum placement experiences, or perhaps the ability to tailor the course of study to meet students' individual career goals or personal life plan by selecting the training modules best suited to their career objectives. For many it is the opportunity to enter the workforce and obtain credible and challenging employment positions upon graduation. Whatever the reasons, The Art Institute of Vancouver - Dubrulle International Culinary Arts proudly takes its place as one of the very best places on the continent to learn more about the fundamental arts and techniques of classic and contemporary cuisine as well as the Business Management practices applied to the hotel and restaurant industry. "Anyone who aspires to be a serious cook, in my opinion, needs a thorough training in modern french classical techniques...."